So what would you do, if informed that the sales assistant in the chemists couldn’t sell you what you requested for another 25 minutes until the pharmacist was back from lunch? I decided I would fill in the time looking for egg cups. You’d never have guessed, now would you? In the early days of marriage, my mother in law quickly cottoned on to my love of the boiled egg. Every morning, when we stayed with her, there would be a breakfast egg waiting for me. Unfortunately it would invariably be so under-cooked that the egg white was still translucent and, being too polite to complain, I would have to force it down - only to be presented, immediately, with a second egg. The smile on my mother in law’s face at the thought that she had given me such a pleasant surprise stays with me. We once went on holiday to Bournemouth as a family, staying in a hotel where the manager actually asked if we wanted “adult sized eggs” or “child sized eggs” for breakfast. We have dined out on that story ever since. Or should that be breakfasted out? It is only in recent days, however, that I have determined to collect egg cups of the Novelty Variety. Egg cups are small in size, so my collection won’t take up too much room (space being at a premium in our house.) Moreover they will be useful to hold my breakfast or lunchtime chookie egg taking it in turns to grace my dining table. My dear friend Eleanor has an amazing collection of mugs, many of which were gifted her by pupils grateful for her endeavours at teaching them All They Needed To Know. When friends visit her for coffee she takes them into her kitchen and tells them “First, choose your mug!” Honestly, visitors are spoilt for choice, it adds a whole new dimension to tea or coffee making. Drawing on Eleanor’s mug collection for inspiration, I am hoping to be able to do the same with my egg cups. Choose your egg cup! I will tell my Tremendous Ten grandchildren when they come to stay. The fact that I can’t actually remember any of them ever requesting a boiled egg for breakfast is Neither Here Nor There. Anyway, with twenty-five minutes to waste this afternoon, I decided to prowl around the charity shops (of which there were a great many) in search of suitably eggcentric egg cups for my collection. 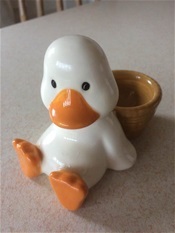 The first two shops yielded nothing remotely egg-worthy but in the Mind charity shop I struck egg cup gold - a whimsical duckling egg cup which was completely irresistible to one such as I. How could anyone have given him up, I wonder? I parted willingly with my £1.50 and watched appreciatively as the fella behind the counter carefully wrapped up my precious purchase in an old copy of the Daily Express. So now I have three egg cups in my collection. Don’t knock it, we all have to start somewhere.